1. Every cent of the night’s proceeds will support NFS’s conservation work. We’re talking support for grassroots efforts that curbed harmful hatcheries, removed dams, protected salmon habitats, and encouraged sustainable fisheries. 2. Mingle with the wild fish community. 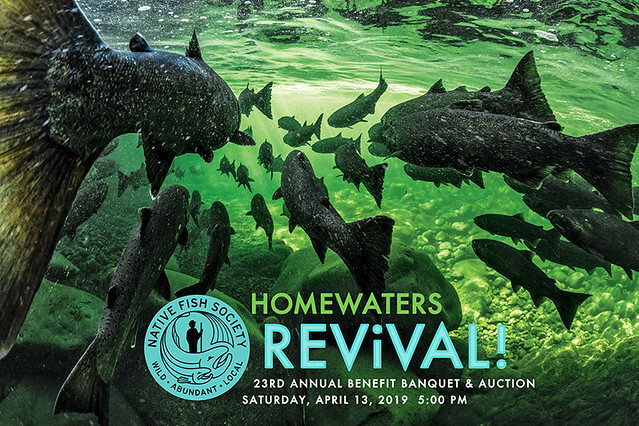 That’s right a whole banquet hall of anglers, river snorkelers, rafters, photographers, scientists, storytellers, advocates, and more united by their love for wild fish and wild rivers. 3. Local, delicious food and wine. Elephants Delicatessen on dinner. Lange Estate Winery and Vineyards, Yamhill Valley Vineyards, and Zivo for wine. New West cider and Arch Rock beer! 4. Great auction items. Over 150 items from international and local trips, to dinners, concerts, fishing, and outdoor gear. Locally tied flies with extra mojo! 5. Oh, and the Patagonia staff and filmmakers involved in their new, full-length hatchery film may make a short appearance! This entry was posted in Fly Fishing Contests, Oregon Conservation News, Oregon Fly Fishing Clubs and Events. Bookmark the permalink.